When a leading paint manufacturer from the Gulf Coast of the United States decided to consolidate and modernize their paint production facilities, it became obvious that the diverse handling characteristics of TiO2, Calcium Carbonate, Resin, Talc and Clay would require a special approach to conveying. Each bulk material possessed different characteristics, each affected differently by conveying properties, with some bulk materials consisting of lumps ’the size of a basketball’. Each ingredient in the process was delivered in a 2000lb (910 kg) bulk bag, requiring the bag to be off loaded and transferred to one of ten Hockmeyer Mixers. In order to accommodate the large number of variable recipes for paint production, including the addition of minor colorants and additives, a site visit was arranged to discuss the best system design and equipment specification to automate the process. Key issues at hand were the difficulty of breaking down the large lumps, as well as finding the best way to handle TiO2. A lump breaker system could be used as a particle size reducer, but presented a problem for the difficult flow properties of TiO2. Upon further site review, a total of four bulk bag unloading and transfer systems were needed, with a required unloading time of just 5 minutes for each 2000 pound bag of TiO2. Additionally, the application required a very minimal delay in loading the mixer as multiple bulk bags were changed, furthering the requirement to avoid wasted time when changing bags. Furthermore, given that the entire system operated in an Explosion Hazard area, engineering challenges for the conveyor system were significant. Aerocon Aero-mechanical conveyors are well-suited for the transfer of a variety of products at the same transfer velocity. Unlike pneumatic systems, Aero-mechanical conveyors can accommodate a wide variety of product bulk densities without the need to change conveying parameters. Additionally, the conveyor does not pump air and therefore requires no filtration. 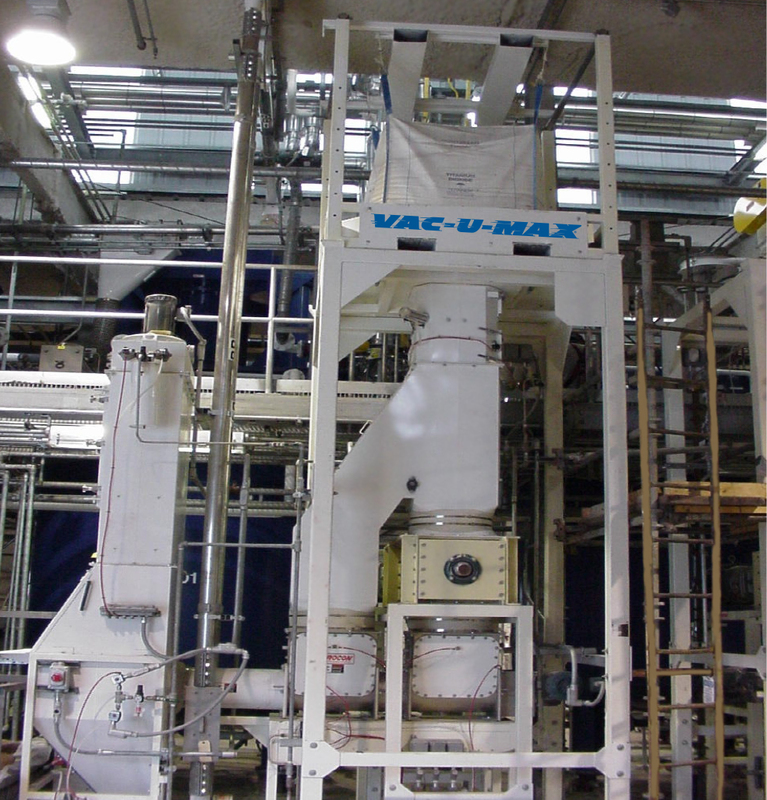 The designed system consists of an Aerocon bag dump station, unique twin hopper screw feeder, purpose-built gravity diverter valve, split-frame type bulk bag unloader, lump breaker, and two Aero-mechanical conveyors. The bulk bag assembly was over 20 feet high to accommodate the diverter valve. Bulk material was unloaded from bulk bags, with minor ingredients hand dumped via integrated reverse jet filter type bag dump station, fed via a screw feeder and on to the first of two Aero-mechanical conveyors. The 450V Aero-mechanical conveyor elevates bulk materials 20’ before turning through 90 degrees and running horizontally for 12’ where bulk material discharges into a second Aero-Mechanical unit. Running at a lower linear velocity, this mechanical conveyor is equipped with three outlet valves. The low profile Rotating Tube Section Valves are pneumatically operated and allow the selection of the appropriate destination mixer. Overall height of each valve is 15” including the operator, which in comparison to the height of a typical filter receiver, allows greater flexibility for low headroom environments. For products such as TiO2 that smear inside conveyor tubes, the Aero-mechanical conveyor has a unique ability to keep the bore of the tube clean because of the method of conveying generated by the cable and disc assembly. Also essential to the success of this particular application was the design of the control panel. 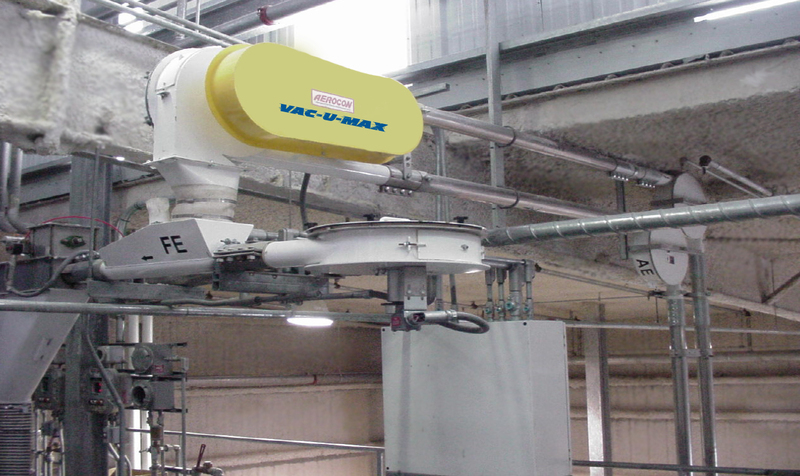 VAC-U-MAX is a UL approved panel manufacturer. Using a Micro Logic programmable controller housed within a ’Z’ Purged standard enclosure, one panel incorporated controls for the motors, reverse jet filter, lump breaker and screw feeder. Additionally, selection of the appropriate mixer and isolation valves were made. The ’Z’ purge enclosure uses positive pressure within the panel to protect against explosion risk. An Aerocon Aero-mechanical Conveyor is constructed of two parallel tubular housings (typically 3” or 4” tubes) containing a continuous loop of steel cable. Polymer discs smaller than the inside diameter of the tubes are mounted at equal intervals along the steel cable. One side of the housing is for conveying and the other is for return. Material inlets and outlets are suitably located for the application. Two sprocket assemblies, one providing drive and linked to a small motor (Typically 2 or 3 hp) and the other guiding the return, complete a basic system. Aerocon Conveyors have major advantages over competitive units by virtue of a superior bi-directional tensioning system that is independent of the drive assembly, offering easy clean self-draining housings, with geared motors as standard. Additionally, Aero-Conveyors are more economical to run, saving on overall energy costs. The Aerocon Aero-mechanical Conveyor is ideal for applications requiring the loading of powders, granules, beans, tea and other friable bulk ingredients from paper sacks, bulk bags, blenders and bag dump stations, including transferring bulk ingredients to packaging lines. Bulk ingredients are conveyed cleanly without segregation, and gently, to avoid product degradation. Application is dust-free, and can accommodate floor level loading.